Honorable mention Outstanding Books Award, Gustavus Myers Center for the Study of Human Rights. Islam, in the Americas, has been the religion of some people of African origin in an almost uninterrupted manner for the past five hundred years. Through the determination of its enslaved practitioners, the religion took hold in the New World and was actively practiced. African Muslim men and women wrote a story of courage, insuperable faith, fortitude, and fidelity to their cultures, religion, and social values. Their success at keeping their faith is not a proof that, in the Americas, slavery was somewhat lenient and accommodating. If the Muslims succeeded in establishing far-ranging networks, forming strong communities, maintaining their intellectual stamina, and preserving their dignity and identity, they owed it to their solid sense of self, to their cultural self-confidence, their organizational skills, discipline, frugality, and strong communality. They took advantage of whatever avenues they could find, and used the contradictions and the cracks in the slave system to their benefit. The African Muslims made decisions, exercised choices, deliberately maintained and sustained their faith, its rites and exigencies. They shaped their own world, re-created their culture and kept their identity. They clearly indicated by their dress, diet, names, rituals, Qur'anic schools, imported religious items and books, that they intended to remain who they had been in Africa. Their education, social background, family history, personal choices, social connections, political convictions, and religious beliefs, did not become irrelevant in the New World. On the contrary, they shaped their response to enslavement. They defined the way they lived it and reacted to it. The person they had been in Africa determined the person they were in the Americas. 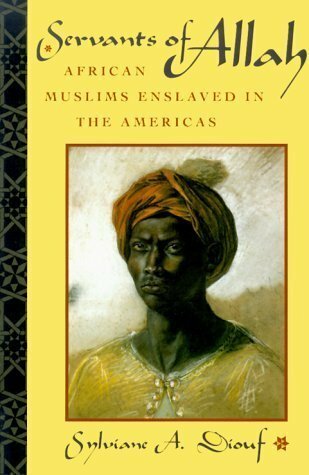 Everywhere in the Americas, the African Muslims left influential footsteps that Diouf intelligently uncovers. Here are enlightening stories ... for anyone attempting to fully understand the settlement and impact of the Old World on the New and on today. A welcome and timely work on a subject of great importance By combining materials on African Islam with New World sources and thereby linking both sides of the Atlantic, the author provides a fresh angle on studies of the Diaspora. Faith and spirituality have always been powerful forces in the histories of people of African descent.Servants of Allah makes an important contribution to a critically important dimension of black scholarship. Director, Institute for Research in African-American Studies, Columbia University. A sophisticated and important book. This creative and refreshing interpretation of West African-Islamic spiritual continuities in the African diaspora is fascinating and very readable. The author's major contribution lies in her great insight into the worldview and the ethos of the African Muslim slaves in the Americas. The scholarship is innovative in debunking the myth that Christianity quickly absorbed Islam. . . The writing is clear and accessible and the arguments are supported with well-researched facts and statistics. [A]fascinating account of the three main topics: the background within Africa, the "difficult and sometimes astonishing steps" of Muslims to maintain their faith and traditions, and the legacy of this nearly-forgotten episode. . . Diouf's account of Muslim life in the most horrific of circumstances is a truly moving one and at times an inspiring one. This book is well-written, clear, and jargon-free. It is informative, broad, and deep. It is a wonderful, essential contribution. Ambitious . . . Diouf shows a remarkably detailed knowledge of her subject and her work is meticulously researched. Her book provides an invaluable starting point for anyone wishing to conduct further research into the fascinating area of slave historiography. A 'must-read' for anyone who wants an education in slave history. Makes a major contribution by focusing on Muslim participation in the slave trade and Muslims' impact in the Americas. Diouf' s well-written and interesting book opens new avenues of inquiry and research.